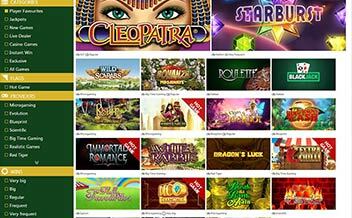 Green Dog Casino is an online betting site owned and operated by Nektan Limited Casinos. The casino was founded in 2016 and features a primary focus on the mobile betting market, offering a wide array of games from some top developers such as NetEnt, Aristocrat, and NextGen Gaming. The casino has a fast payout time making it a perfect pit spot to gamble at. The casino is a new entrant in the business and mostly emphasizes on online slots but players will also find Blackjack and Roulette variants as well as a few scratch games. The site’s instant-play interface makes it easy to find any game. Green Dog Casino is licensed by the United Kingdom and Gibraltar. The Casino’s players are protected with SSL encryption and it offers 24/7 customer support via email and a toll-free call line. 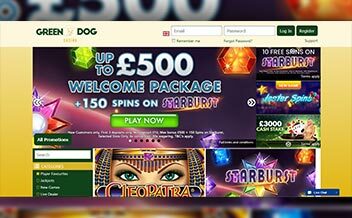 On signing up at Green Dog Casino, you receive a first deposit bonus of 100% up to £100 and a wagering requirement of 30x on slots. A 50% second deposit bonus up to £200 and a wagering requirement of 30x on slots. There is also a 50% third deposit bonus up to £200 and a wagering requirement of 30x on slots. Slot lovers have a lot to enjoy at Green Dog Casino as it is all about slots. Players here will find top online slot games from Aristocrat, NetEnt, NextGen Gaming, and Nektan. Among the most popular games include Best of British slot, Starburst slot, Gorilla Go Wild slot, Koi Princess slot. Miss Kitty slot, and Merlin’s Millions slot. No wide-area network progressives are offered, however. If table games are more of your thing, then it’s quite unfortunate, because Green dog casino offers very little cause video slots make up the casino’s bulk of games. The casino only offers Blackjack and Roulette variants. If video poker is your game of choice, there’s very little, unfortunately, that the casino offers. 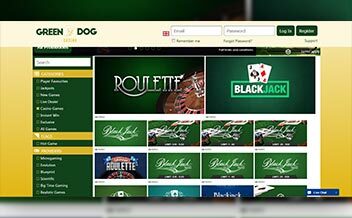 Green Dog Casino uses software from giant developers like Aristocrat, NetEnt, NextGen Gaming, and Nektan. The casino uses an instant play interface that makes navigation through the site easy. Green Dog Casino does not accept players from the following countries: American Samoa, Guam, U.S. Minor Outlying Islands, U.S. Miscellaneous Pacific Islands, U.S. Virgin Islands, United States. NETELLER,Paysafecard,Skrill-Moneybookers,Visa,Visa Electron, Direct Bank Transfer,SOFORT Banking,Trustly,Giropay,Zimpler,PayPal. US dollars, Canadian dollars, Euros, British pounds sterling, Swedish Kronor, New Zealand dollars, Australian dollars. Virtual City Casino is supported by major browsers such as Mozilla and Chrome. The mobile version of the casino features most of the games found on the desktop version in a convenient touch-based interface. Virtually all modern smartphones and tablets are supported, including iOS and Android devices. Has a 24/7 support via UK free phone and email. 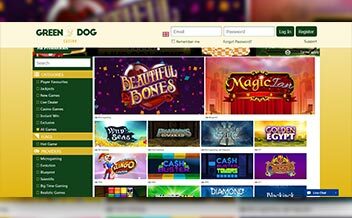 Green Dog Casino uses software from giant developers like Aristocrat, NetEnt, NextGen Gaming, and Nektan that feature top gaming slots which are the main and leading games on offer. Despite providing top-notch slots, the casino offers a very limited edition of table games and video poker games hence failing to cater for some clientele base interested in such games.